Wanda Hunter serves as the Assistant County Administrator for Citizen Services overseeing a number of County offices including Library Services, Public Safety, Intervention and Detention Alternatives, and Human Services and Community Partnerships. Wanda was the Director of Intervention and Detention Alternatives before her promotion to Assistant County Administrator. Through her promotion, Wanda will oversee the County's community service offices including: Library Services, Human Services and Community Partnerships, EMS and the Office of Intervention and Detention Alternatives. Wanda has over 26 years of proven experience with Leon County. 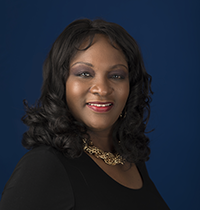 During her career, Wanda has worked through-out the organization in a number of progressively more responsible positions, including M/WBE, Employee Relations, Special Projects, and Pretrial Release. In her previous role as Director of Intervention and Detention Alternatives, Wanda was a highly effective communicator, capable of working successfully with a diverse user community, including the Judiciary, State Attorney, Public Defender and law enforcement. Prior to joining Leon County, Wanda earned a Bachelor’s degree from Florida State University. Wanda brings a depth of understanding and level of experience that strengthens the overall management structure of the County.